The 2019 Star Wars™: Imperial Assault World Championship begins Saturday, March 30 at AdeptiCon in Schaumburg, Illinois. There, after facing numerous opponents, testing his or her abilities in the most demanding situations, and surmounting all risks, the winner will claim the game's top honors—its ultimate rewards. What are those rewards? They're extended art cards, custom tokens, dials, and dice that commemorate players' victories and that they can use to upgrade their armies. These rewards start at the participation level and increase in value and rarity as the field narrows. Most importantly, the prizes at the 2019 Imperial Assault World Championship are only available to those who assumed all the risks involved—entering the battlefield, dodging blaster fire, parrying lightsaber blows, challenging for objective points, and fighting for the fate of the galaxy! A Rebel strike force confronts Lord Vader during the 2018 Imperial Assault World Championship. 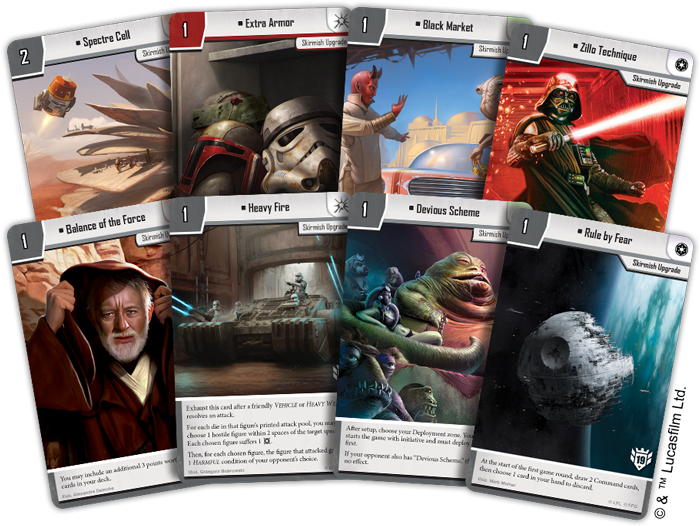 Each participant in the 2019 Imperial Assault World Championship tournament receives a set of four double-sided, extended art skirmish upgrades—one for each of the game's three factions and one neutral card. 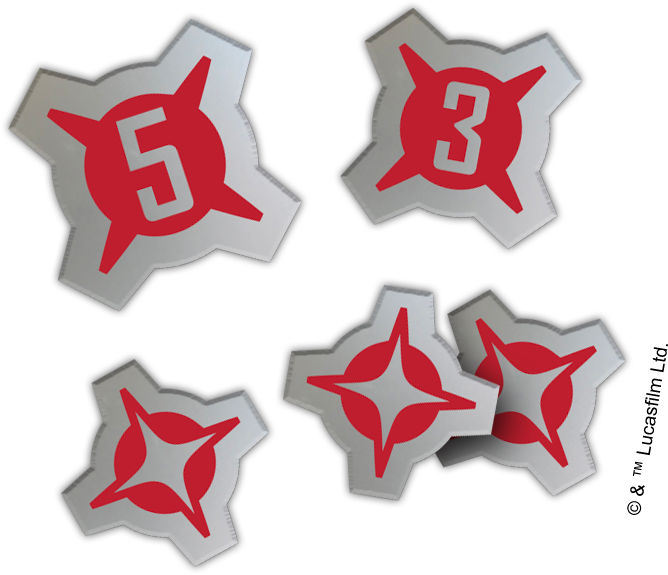 No plan survives contact with the enemy, but every player who stays in the fight—whether they're winning or simply pressing forward despite their injuries—will receive a set of acrylic damage tokens for each Swiss round they complete. These include one five-damage token, one three-damage token, and three one-damage tokens. Which faction will you support throughout the 2019 Imperial Assault World Championship? The answer matters more than ever. Not only will participants want to help shape the fate of the galaxy, but we'll reward the Top 16 players from each faction with a special Galactic frame version of one of their more notable characters. The Top 32 competitors will be able to upgrade not only their armies, but also their battlefields with a range of custom tokens. 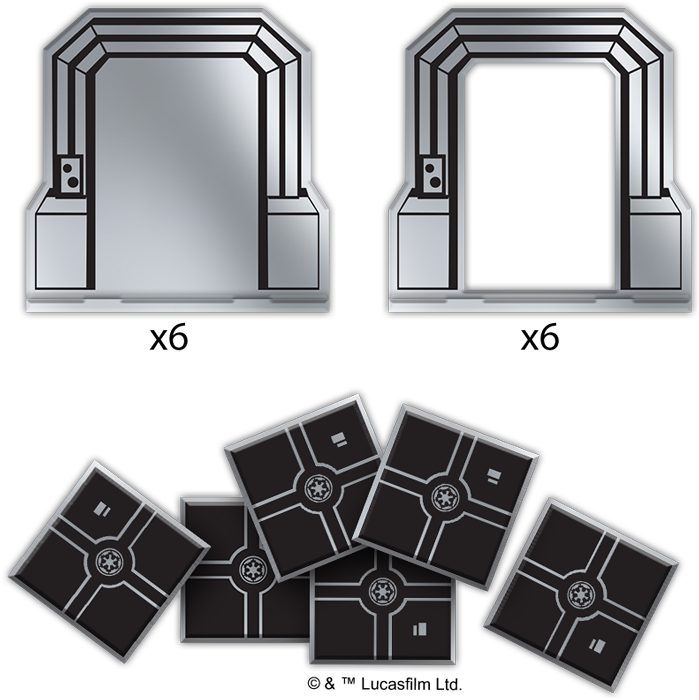 Each player making the Top 32 of the 2019 Imperial Assault World Championship will receive six custom crate tokens, six closed door tokens, and six open door tokens. 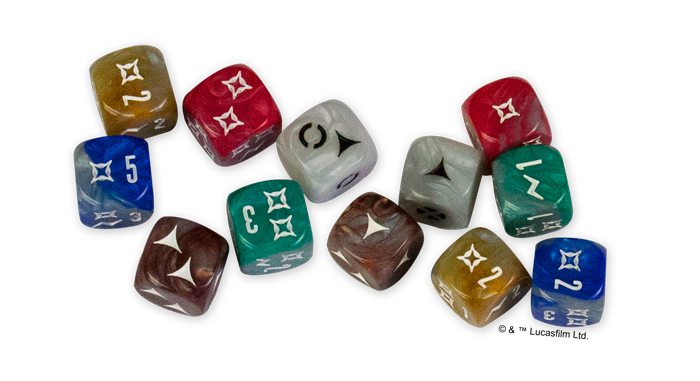 As the battles rage on, and the most successful commanders help their armies secure the battlefield's most important positions, the Top 16 players will earn a bounty of dice to use in future games—two sets of ten dice each. 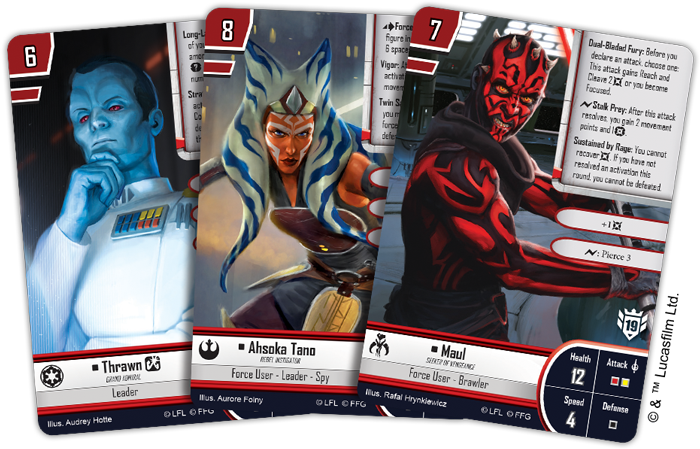 The Top 4 participants each receive a set of all three Galactic frame deployment cards: Thrawn, Maul, and Ahsoka Tano. It will take fantastic determination to reach the final table of the 2019 Imperial Assault World Championship—the sort of single-minded focus on a goal that can drive an individual to survive and thrive in the harshest conditions… even when others might perish. 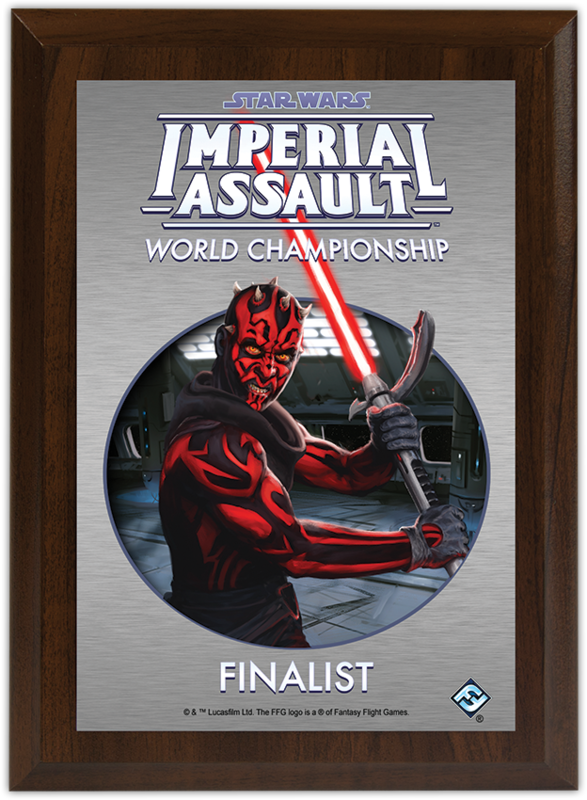 Such determination is aptly rewarded by the Finalist plaque that features a vengeful Maul, snarling and ready to confront his foes with his signature double-bladed lightsaber. After having risked it all—and successfully rising to each new challenge—the World Champion will claim an assortment of prizes well worth the completion of his or her mission! 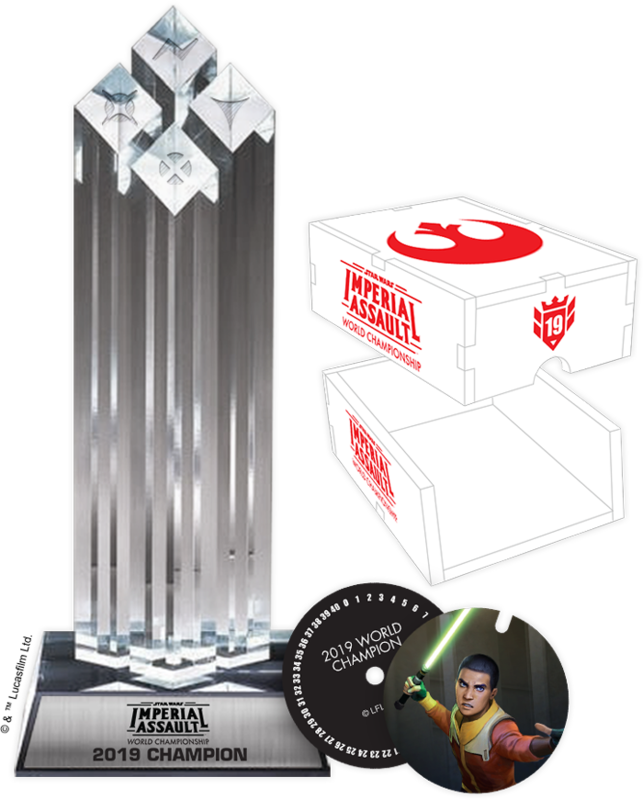 The 2019 Imperial Assault World Champion will win several one-of-a-kind prizes, including an acrylic point dial featuring a print of the young Force user, Ezra Bridger; an acrylic card box to hold his or her command deck; a stunning four-pillar trophy; and flight and accommodations for the 2020 Imperial Assault World Championship! If you want to tap the full measure of your abilities, you need to take some risks. 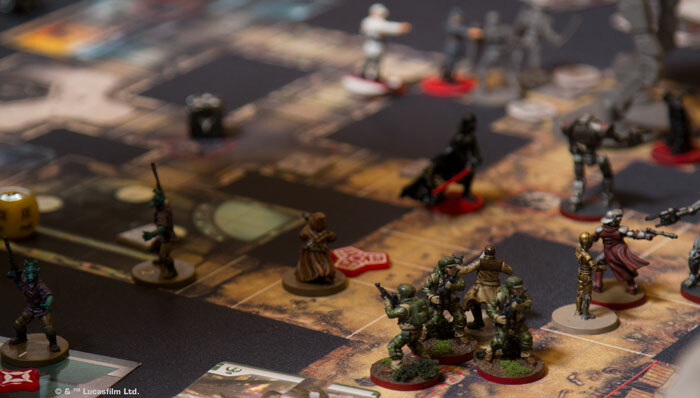 And that's why we're rewarding all those who chose to risk their armies—the heroes and villains—during the tense, fast-paced skirmishes of the 2019 Imperial Assault World Championship! Who will win? Who will claim the event's various prizes? We'll post live updates during the event on Facebook and Twitter @FFGOP, and we'll share highlights in an article shortly after the event concludes! Enter the Star Wars™ galaxy in your games of Imperial Assault! Two complete games offer a full Star Wars experience within Imperial Assault. In the campaign game, a few Rebel operatives battle the Galactic Empire in a series of cinematic missions. The skirmish game, on the other hand, allows two players to gather their own strike teams and battle head-to-head over conflicting objectives.